Sea Turtles are an endangered species. Sea Turtle Conservation is vital to the survival of these tiny hatchlings. Of the 10,000 born, only 1 might live to adult maturity. SeaTurtleLighting.net offers the largest selection of FWC Approved and Turtle Friendly Lighting products available. Choose from Fixtures, LED Light Bulbs and more! Having Turtle Safe Lighting is more than having the right fixtures and light bulbs. Safe lighting requires the appropriate techniques of Beachside Shielding. If you have questions about implementing Sea Safe Lighting, contact us, or view the largest online directory of Sea Turtle Contacts and Resources. 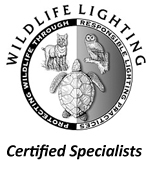 SeaTurtleLighting.net is a company comprised of the lighting industries sharpest lighting consultants that have been specially trained and certified as "Sea Turtle Lighting Consultants." With over 20 years experience in the lighting and electrical industries, our experts have devoted their time, and attentions to the conservation of endangered Sea Turtles. Through application, design and specification, our team develops and implements lighting techniques through use of approved Lighting Fixtures, Light Bulbs, LED Lighting and Beachside Shielding to ensure your property is safe for residents, guests and Sea Turtle Conservation. Additionally, SeaTurtleLighting.net and its employees work closely with Private, Non-Profit, State Agencies and Local Municipalities to constantly bring forth new technologies and assisting property owners and managers in taking the correct actions to comply with Sea Turtle Conservation Laws and Lighting Ordinances. Sea Turtle Lighting Doesn't Leave Your Property In The Dark... Just Sea Turtles! Often times when approached about the requirement of Sea Turtle Safe Lighting, Property Managers and Owners get the impression that the Sea Turtle Folks expect them to be in the dark. This simply is not the case, although we understand why one might feel that way. Simply stated by a Sea Turtle Permit Holder or Code Enforcement, "Your lights are too bright and visible from the beach." What they are really telling you is that your lighting can be more user friendly, effective, and energy efficient. 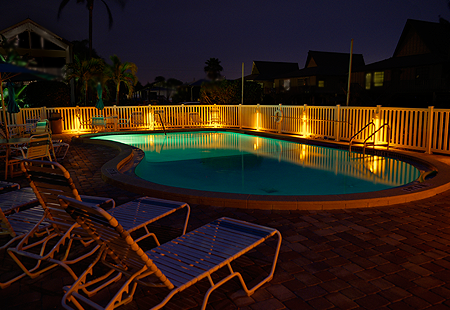 Mostly, outdoor lighting is wasteful illumination into the sky and adjacent properties. This is because the majority of wall lights, ceiling lights and flood lights are emitting light in 360°, when they really don't need to. The basic concept of Sea Turtle Lighting it to use specific types of light sources such as Light Bulbs and LED Lighting that emit a wavelength of 450 nanometers. This wavelength is virtually invisible to Sea Turtles, except where they can directly view the intensity of the light source itself. Then this light source is paired with a lighting fixture that directly controls the direction and beam spread of the lighting. This means that light is effectively and accurately lighting the areas of concern without wasteful light. Coastal properties that chose to upgrade to Sea Turtle Lighting Systems employ the latest in energy efficient lighting and design. This means they operate more effectively and efficiently than traditional outdoor lighting systems while saving on the electric bill. Any property along coastal areas and waterways where Sea Turtles nest is subject to this requirement, however when specified by a Sea Turtle - Lighting Professional, the lighting will not only keep Sea Turtles safe, it will also accentuate and leave your property looking beautiful!